I don't have a photo step-by-step for this because the lighting was bunk in my sewing room when I made it, but I hope that it's all clear! I'm happy to answer questions, but it's very straight-forward. Read carefully through the instructions before you try and make it. It will help, I promise. I'm wanting to try one that is dyed, so if/when I make that, I'll be sure to take photos as I go. Let's hop to it then, shall we? -Coordinating elastic (I used beige) that is at least 1 inch thick. 1.5 inches would be ideal. 1. Make a muslin skirt by measuring the widest part of your hips, adding two inches for the width and using your desired length. Sew or serge along the sides and hem the bottom if you'd like. This will act as a slip, so make sure to make it shorter than the other layers so it doesn't show below the hem. 2. I wanted my skirt to be a midi length so that as my baby bump grows, my skirt won't be too short. Feel free to cut yours to your desired length at this point. Starting at the top of where your fabric is cut (not the selvedge), divide your fabric by the amount of layers you want. Again, I did three so I cut my fabric into three equal parts. 3. Serge or sew the selvedge edges together to create your three separate layers, flip right side out. 4. Putting one inside the other and repeating, line up the top of all of these layers (the selvedges should be lined up in the back), pin and sew two rows across the top using elastic thread. This will get it started gathering. Tie the elastic threads together in a knot in the back. 6. Pull the elastic around your waist, or wherever you'd like your skirt to "sit." This will be your waistband, so don't stretch it too much, but make sure that it will stay up and not be too loose or too tight. Add an inch and cut. 7. Sew the elastic ends together and then sew down the "flaps." Pin the elastic to the right side of the skirt layers (the top with the elastic thread), making sure that you are covering up the elastic thread. Pin in about four-six places and sew around the top using a zig-zag stitch. Make sure you are stretching the elastic as you go so that it gathers the tulle more. This tutorial should help a bit with basic construction of the waistband. -I left the hem raw on all the tulle layers so that it would have volume and fluff. 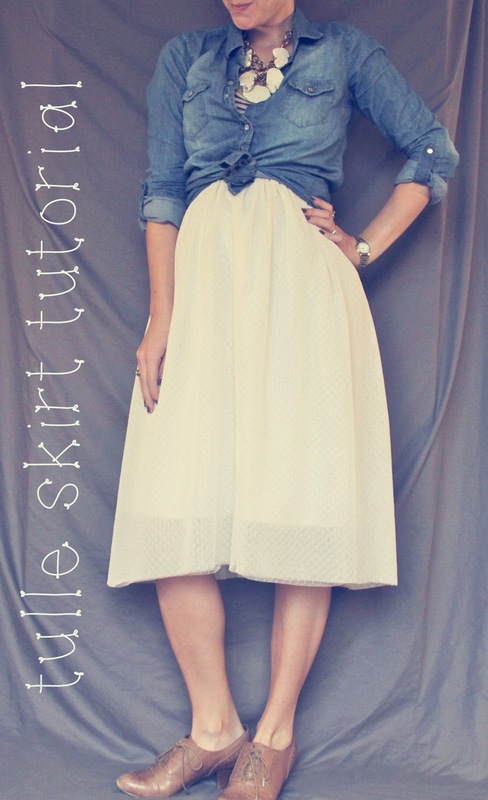 -If you want a fuller skirt, make it more a-lined and or use more layers of tulle. I didn't want mine to be super full because, well it looks more costumey, in my opinion. -I spent less than $20 on this skirt. Sure beats $188 at Anthro, eh? -A satin ribbon would be really pretty tied over the elastic waistband. Enjoy and check out this post for SIX ways to style your new skirt! Nice job, it's so cute! Question: have you announced the winner for the Nov. sponsor giveaway yet? Did I miss it? So fabulous–and just in time! I've got that Anthro skirt in my shopping cart! This is simply gorgeous!!! 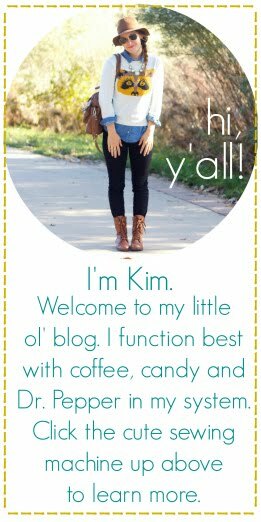 I would be honored if you would consider uploading a photo of it (and any other sewing tute or pattern you might have) into SewSet. SewSet.com is an on-line sewing search engine aimed to bring all independent designer's creations into one place for sewists to be able to see, save & search! This needs to be in there, I love it so much! Thank you for sharing! I want to try this with a lace overlay! You’re reading my thoughts! I was just thinking about making one for my daughter the other day.